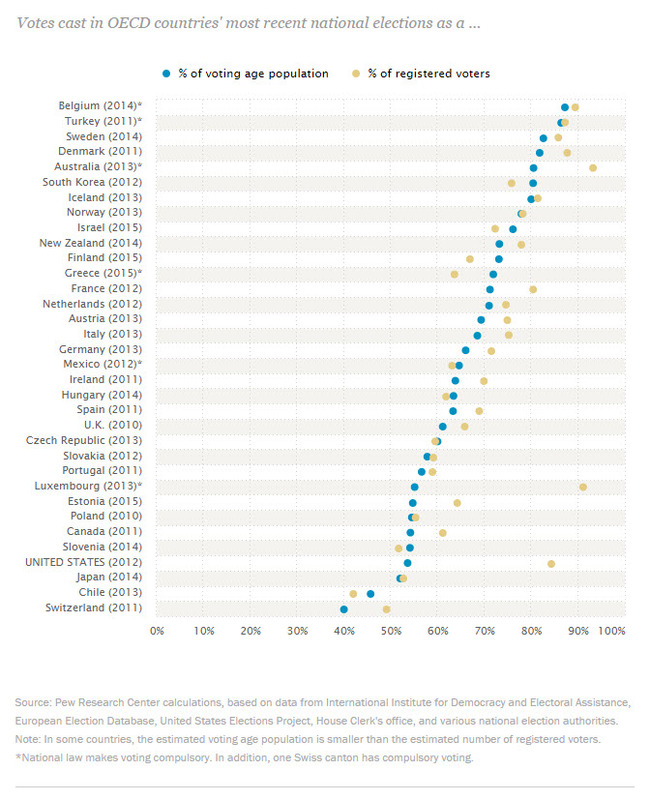 According to a Pew Research Center survey of the top 34 developed countries, of which the U.S. ranks 31st of 34 in voter turnout. All of the 34 countries surveyed were part of the Organization for Economic Cooperation and Development (OECD). Six of the OECD countries have compulsory or mandatory voting including Belgium and Turkey, which appears to vastly affect voter turnout. 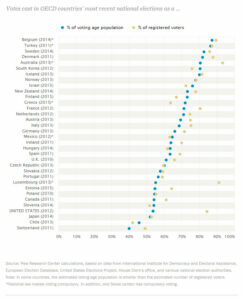 Among OECD countries, the highest turnout rates were in Belgium (87.2%), Turkey (86.4%) and Sweden (82.6%). The U.S. turnout in 2012 was 53.6%, based on the 129.1 million votes cast for president and an estimated voting-age population of just under 241 million people. While compulsory voting laws are not strictly enforced, they seem to have a strong impact on voter turnout. When Chile moved from compulsory to voluntary voting in 2012 turnout plunged from 87% in 2010 to 42% 2013, even as the voter rolls swelled by 64%. U.S. turnout in 2012 was 53.6%, based on the 129.1 million votes cast for president and an estimated voting-age population of just under 241 million people. The United States calculations were based off of information from the 2012 general election. The information on America’s voter turnout only incorporated the voting age population, rather than the actual number of registered voters.